The so-called Behaviour Change Activities (BCA) are activities targeting African diaspora communities from countries with a high FGM prevalence rate. These activities are organised by the CHANGE Agents and aim at raising awareness, changing attitudes and promoting behaviour change towards the abandonment of FGM in practising communities. Every CHANGE Agent is free to decide on the type of activity she or he wants to implement. They can organise film screenings and panel discussions to raise awareness among a bigger group of persons, or initiate more intimate discussions within specific groups, e.g. young mothers or religious leaders. However, the project partners will support the CHANGE Agents at all times: When they are first designing and planning the activities, while they are implementing and finally evaluating them. To get a clearer idea of what a BCA might look like, check out previous CHANGE Agents’ reports. Participants of the 4th Exchange Meeting. 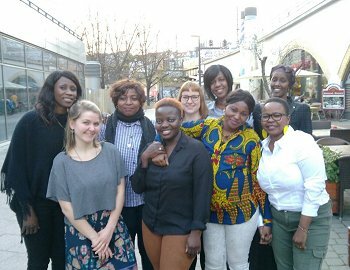 Photo: © TERRE DES FEMMESOn April 29, 2017 the CHANGE Agents in Berlin got together for their fourth exchange meeting. This time, Sister Fa (Fatou Diatta), urban Soul and HipHop singer and activist against FGM in Senegal, invited them for delicious Sengalese food at her house. Together they shared experiences of their behaviour change activities and talked about the planning of future events. Isatou Barry, CHANGE Agent from Gambia, talked about her first behaviour change activity and reported that many participants, especially the men, had been very grateful for receiving important information about the consequences of FGM. At the end, some emphasized that they (now) rejected the practice of FGM and that they would share the information about the harmful practice amongst their family and friends. Evariste Franz Kapnang Tchaptchet, CHANGE Agent from Cameroon, could not attend the exchange meeting as his first behaviour change activity, a discussion meeting with a few women and many men, took place simultaneously. On April 20, 2017 the first behaviour change activity within the Gambian Community in Berlin took place. CHANGE Agent Isatou Barry invited family and friends for the baby shower of her new-born child and seized this opportunity of having many people gathered together to have a discussion on children rights and the protection of children, together with activist and musician Sister Fa (Fatou Diatta). Within the frame of children rights, they placed the topic of FGM. Isatou Barry and Sister Fa answered many questions and provided further input for a lively discussion, in which also the men present participated. Photo: © TERRE DES FEMMES On March 31, 2017 the CHANGE Agents in Berlin got together for their third exchange meeting. Dr. Idah Nabateregga and Charlotte Weil from TERRE DES FEMMES (TDF) reported about the new developments within the CHANGE Plus project and the FGM department at TDF in general. Thereafter, the CHANGE Agents shared thoughts and ideas about their behaviour change activities, which they are preparing and planning this year. CHANGE Plus Community Activity. Photo: © TERRE DES FEMMESOn February 25, the CHANGE Agents in Berlin got together for an exchange meeting. Fadhumo Musa Afrah had already conducted her three behaviour change activities in January and February and now reported on the intra-communal discussion on FGM that she initiated. Fadhumo pointed out that the challenges for organizing the behaviour change activities lay mostly in the difficulty to mobilize community members to discuss FGM and join a meeting.